The 2A Armament Titanium takedown pin set features a through drilled design for maximum weight savings in a standard .250 pin size. The head of each pin also incorporates a pocketed feature to reduce weight. 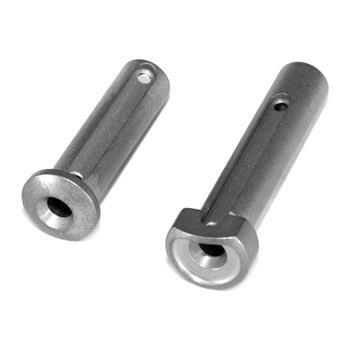 Each pin is machined with a single operation on our 8-Axis CNC Machines for true concentricity, and consistency. Using certified U.S.A. 6AL-4V Titanium these pins weigh in at 0.18 oz total for both pins combined.